Satyendra Jain is a trusted soldier of AAP, that too possessing a high rank of cabinet minister, and holding the health portfolio. This is of course because AAP supremo Arvind Kejriwal considers him as one of his close aides. This was also seen when AAP & Kejriwal rallied behind Jain and gave him a clean chit when allegations of financial impropriety were flung at Jain. In the first case he had referred to Kejriwal as “Aalo”, meaning potato, a word which became synonymous with Kejriwal after allegations that it was a name given to him by a woman with whom he had an alleged extramarital affair. 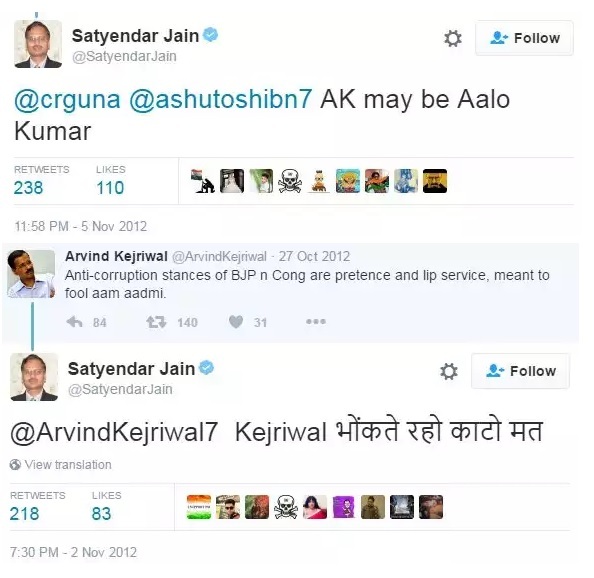 In the second case it appears Satyendar was taunting Kejriwal rather coarsely for indulging in only words and no action, even comparing him to a dog. Jain may have deleted these embarrassing tweets, but they live on forever.